Here's an example of assembly interrupt handler routines for AVR using WinAVR / gcc. Hopefully I can save you the couple of hours it took me to figure this out. The .global directive tells the linker "here's the interrupt service routine" and the appropriate jump instruction is filled into the vector table. 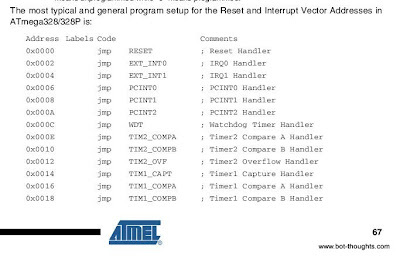 When the interrupt fires, the program counter moves to that spot in the vector table, the jmp is issued and your ISR code is run, then returns from interrupt with the reti instruction. ...and edit the file, and look for the __vectors table, excerpt below. You can see below that I have vectors 1 and 2 defined and several undefined. These interrupts would result in jumps to __bad_interrupt, halting the MCU. So, what are these mysterious __vector_XX addresses? You can find out by consulting your datasheet. For example, in the ATmega328P datasheet, reproduced here for educational purposes: Vector 1 is INT0, vector 2 is INT1, and so on.